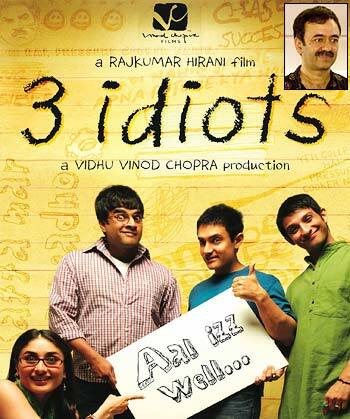 Rajkumar Hirani has moved on from his blockbuster Munnabhai series to 3 Idiots, from Sanjay Dutt to Aamir Khan. The director, who landed on the Bollywood map out of nowhere, tells Patcy N what to expect from his new film, out on Christmas Day. What made you decide to take on 3 Idiots after announcing Munnabhai Chale Amerika? I was slightly exhausted doing two back-to-back Munnabhai movies. And for the third part, I would have to think about Munnabhai and Circuit again -- the same style, clothes and everything. I wasn't too excited about that. Also, I thought that if I write a script, it may not be as exciting. On the other hand, I had the germ of an idea of 3 Idiots. I was trying to concentrate on Munnabhai but my mind would think about 3 Idiots. In the end, I realised I had written more on 3 Idiots than Munnabhai. So I decided to make that. Now that 3 Idiots is done and my mind is fresh, I will work on Munnabhai Chale Amerika. But why Chetan Bhagat's novel Five Point Someone? Chetan gave me this book to read and I wanted to make a film on it. But I knew right from the start that I could not make a film completely on the book, as it was very anecdotal and a film needs a plot. So I had decided to rewrite it in a screenplay format. You'll see that the film is very different from the book. After I wrote the script, I called Chetan and narrated it to him. I told him that if he did not like the script, I would stop the project. But he was okay with it. 3 Idiots is a film about college students. But your lead actors are much older. What made you cast them? I would like to ask a question in return: What is the job profile of an actor? Have you not seen a city-bred urban actor play a villager? Or Dustin Hoffman play a woman? So it's the job profile of an actor is to play characters. We have seen younger guys play older people, so why can't an older man play a younger guy? The guys I have chosen have that quality that I wanted for the film. Aamir (Khan) has innocence. When you watch the film, you will see why I needed that honesty. He has led a life like Rancho, his character in the film. He shares a lot of similarities with his character. Also, I needed a good and competent actor like him to play such a complex role. Besides, an actor needs challenges. Aamir told me that he would look younger than he did in his last couple of films. He developed a new body language and changed his clothes. He would play badminton before the shoot so that his face looked flushed. I think it was a great decision taking Aamir. Was he as interfering as he is reputed to be? I don't know where these stories come from. I know this is Aamir's perceived image and whatever he does, it will be difficult to wipe out that image. But I faced no issues like that. I think Aamir's dedication is mistaken as interference. I would rather have a dedicated guy than an indifferent guy. I expect Aamir to tell me his view points when I am directing a scene. Aamir is known to be a perfectionist. What about Madhavan? Aamir and Sharman (Joshi) lost a lot of muscles but Madhavan did not. But if you look at IIT or IIM students, you won't find every student boyish. You come across fat students too. Before directing the film, I went to IIT-Mumbai and IIT-Delhi and to some engineering colleges as well, and took pictures of the students. I spent time with them. I needed these references for the clothes they wore, the way they looked, the things they carried. Many IIT students even looked older than these characters. Did you have a workshop before you started on the film? We rehearsed for over a month. We started by reading the scenes and getting familiar with them. Then we picked up some key scenes, and finally, rehearsed the entire film. Then we did costume and make-up trials. All the actors have two different looks in the film -- one is when they are in college and then, five years down the lane. Have you added any anecdotes from your own college days? Many. Even in Lage Raho Munna Bhai, the scene when the girl goes to meet her prospective husband in a restaurant and she asks Munnabhai how she should select the boy, and he says to see how he behaves with the waiter (is taken from my life). Even the spitting scenes were from my life. Your heroines like Gracy Singh and Vidya Balan usually stay in the background. What about Kareena Kapoor in 3 Idiots? You have to be true to your film. We are used to formula filmmaking in this country so we assume that every film has to have a love story. But you have to be true to your film. If the heroine's role is less, you have to accept it. In Lage Raho Munna Bhai, we had added a few romantic scenes and songs in the scripting process, but later removed them because they did not fit in. The Munnabhai series were like Charlie Chaplin movies. Does anyone remember the heroines of those films? Kareena came on board knowing her role in 3 Idiots. Were Aamir, Kareena, Sharman and Madhavan your first choices for the film? No. I thought about many actors before short-listing this cast. I even went on a six month nation-wide hunt to audition people. But we had to establish the actors because the film had two looks. Plus, the experience was necessary because the roles were very complex. We thought of Shah Rukh Khan but it did not work out. We were thinking of different actresses but did not approach anyone. As soon as Aamir came on board, Kareena was finalised. Why did you decide to stay on campus at IIM-Bangalore? I think that was the wisest decision. Aamir came up with this idea because it meant we would not have to travel to the location for the shoots. Madhavan was a bit reluctant, but later agreed. On campus, the actors mingled with the students and that helped. It was like going back to college. From Sanjay Dutt and Arshad Warsi to Aamir, how different are these actors from each other? Every actor has a different personality. It's a director's job to understand their personalities and give them freedom to operate from that. You have to make the actors comfortable because he will be seen on screen. For Boman (Irani), I have to start preparing well in advance. He loves to rehearse and visit the locations in advance. 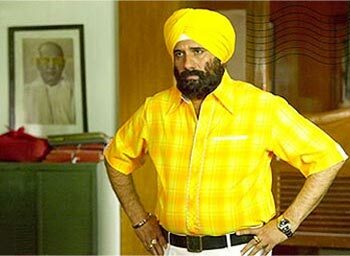 When he was playing Lucky Singh in Lage Raho Munna Bhai, he met a lot of Sardars. He would call me at strange hours and say that he was drinking with some Sardars, and that why don't I come over to see how he was behaving. I don't do rehearsals with Arshad. When you give him dialogues, he does not say them verbatim. He will pick up the gist and say it in his natural style. He may fumble while saying the dialogues or not say grammatically correctly sentences, but that's how we speak normally. You cannot call Sanju for rehearsals, he gets very impatient. But if you give him two pages of script, he will memorise it in 15 minutes. He will do the scene in a particular way. If you don't like it, he'll give you an alternative in no time. He is an impromptu actor. Aamir is a very involved actor; he likes to prepare for everything. I like that because then you can change things if they're going wrong. So every actor has a different style. Boman Irani has some funny make-up in the film, with a name like Virus. How did that happen? His look, lisp and mannerisms are all Boman's creations. The name Virus was generated by us, as students always give names to their professors and principals. He did not want a costume designer. He went to an old tailor, who stitches clothes for Parsis in Dadar (in north-central Mumbai). He bought the cheap fabric himself. You wanted to become an engineer but landed up as a film editor. How was the journey? Earlier, people either wanted to become doctors or engineers. So I decided upon engineering. But my Standard 12 results were not good, and I could not get admission into a college with science. So I took up commerce. I never attended lectures. Now, I feel those three years were a waste of time. But they gave me time to dabble in theatre, where we started a group called Aawaaz. I would act, direct and write. My father asked me to join FTII (the Film and Television Institute of India). I did not get admission in the direction course, so I took up editing. That was a blessing in disguise. Your father owned a typewriting institute in Nagpur. Did he mind that you wanted to become a director, and not take over his institute? We used to live in a joint family set-up. We were not rich, but well off enough. My father came to India at the age of 14 from Pakistan, managed to get a job, look after his family and even educate himself. Later, he started a typewriting institute with two typewriters, and went on to have 40 typewriters. But he always let me do whatever I wanted. 3 Idiots is a slice of my life because I was just average in school and college. But since I enjoyed myself at FTII, I studied well and earned a scholarship too. What were your struggling days like, before you joined Vidhu Vinod Chopra's team on Mission Kashmir in 2000? My father wanted to buy me a house in Mumbai by the time I completed my FTII course. But due to some financial constraints, he could not. I put up in a paying guest accommodation and looked for jobs. But the good part was that I came with my FTII friends, so I was not alone. In fact, the way I came to Mumbai has a funny story. After I finished my editing course in FTII, I returned to Nagpur. I was to return to do a video course. My friends -- Sriram Raghvan (who went on to direct Ek Hasina Thi and Johnny Gaddar), cinematographer Hari Nair (who went on to work in Kerala Cafe) and sound designer Bishwadeep Chatterjee (who went on to work in Parineeta, Lage Raho Munna Bhai and Eklavya) -- and I had decided to go to Mumbai together, stay at Sriram's house, and start our struggles from there. When I returned to the institute, my belongings were not in the hostel room any more. When I enquired, I learnt that the video course was cancelled, and my friends had gone to Mumbai. I was very upset as they had not informed me. I went to Mumbai the same day and landed up at Sriram's house. When my friends saw me, they started laughing. They had played a prank on me, and deliberately not told me anything. The next day, I woke up to the sound of coins. I saw the boys taking one rupee coins and going to a nearby public telephone with a film directory, to call filmmakers before they left their homes. At first, I was confused. But 24 hours later, I was doing the same thing. I did not want to ask my parents for money, so I sold my camera for money for my expenses. I got my first job within a week but did not get paid for a month. After six months, I returned to FTII to finish my video course. When I returned, I got a job in an editing studio for Rs 1,200 per month. Later, I took up freelance jobs and directed films and ads. Then I joined the Mission Kashmir sets in 2000.